Metallica are sharing professional video of a May 19 performance of their 1997 single, “Fuel”, at Gillette Stadium in Foxborough, MA. The tune was the third single from their seventh album, “Reload”, which debuted at No. 1 on the US Billboard 200 on its way to US sales of more than 4 million copies. Launched in Baltimore, MD on May 10, the trek was previewed with a live stream of the group’s final rehearsal before about 300 MetClub fan members via Facebook Live from the city. 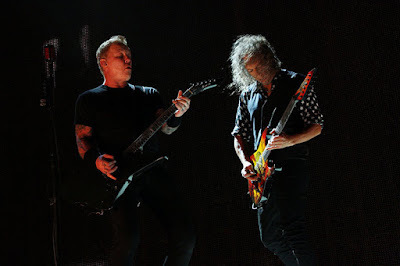 Following a May 21 appearance at Columbus, OH’s Rock On The Range, Metallica are now enjoying a two-week break before resuming the run at Busch Stadium in St. Louis, MO on June 4.